As many as 34,000 Londoners with a history of injecting drugs have hepatitis C, yet only around 800 a year receive treatment, despite the availability of NICE-approved treatments that cure most people. Patients fall through the gaps between disjointed services that are not configured for the needs of vulnerable groups. 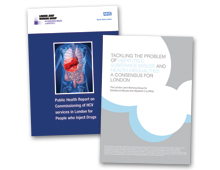 The London Joint Working Group on Substance Misuse and Hepatitis C (LJWG) is a group of expert clinicians, patient advocacy and voluntary sector leads whose ambition is to eliminate hepatitis C in the drug-using population in London within 20 years. Recent activity has focused on three key areas. Firstly, delivering a best-practice blueprint for integrated services, with a care pathway and recommendations written in consultation with over 300 London stakeholders and published in the Health Service Journal. Secondly, in order to effect real change, they galvanised a broad coalition of key stakeholders from the public, private and policy sectors all focused on the common goal of joining up services in order to improve patient access to treatment and support. Finally, they developed a ‘bottom-up’ implementation plan in the context of NHS reforms, starting with a robustly evaluated pilot phase to assess the effectiveness of the recommendations in practice. This was a good solid collaboration and pooling of resources focused on long term health outcomes that showed sustained relationships and expansion of the stakeholder group. The scale of ambition and depth of partnership was impressive.